A very recent discovery in central Brazil baffles archaeologists; yet is consistent with similar prehistoric mysteries around the Earth. WASHINGTON, September 18, 2003 - Newly discovered traces of ancient roads, bridges, and plazas in Brazil's tropical forest may help dispel the once-popular impression of an "untouched" Amazon before the Europeans' arrival. In southern Brazil, archaeologists have found the remains of a network of urban communities that apparently hosted a population many thousands strong. Reporting their findings in the journal Science, published by AAAS, the science society, the researchers say the people who dwelled there dramatically changed their local landscape. Michael Heckenberger of the University of Florida and his colleagues made a surprising find in the upper Xingu region of the Amazon. work of large villages in a carefully organized, gridlike pattern.' Heckenberger reported that: No part of this land was wild and pristine. The sections of high vegetation were more like 'large parks' than untouched forests. A satellite image shows complex regional settlement patterns and large-scale transformations of local landscapes over the past millennium. Soil quality was too poor to support any type of agricultural community. Yet, this new discovery in the Amazon reveals that thousands of early indians inhabited the settlement. The long lost, Xingu Amazons required half-decent soil in order to grow crops. So often, prehistoric civilizations thrived in places thought to be too inhospitable; such as: Tiahuanaco, Machu Picchu, Central America, Egypt, Tassili, Easter Island and Australia. If we investigate the major, ancient sites of human civilization, there is a MYSTERY. If we examine and compare the first places of intelligent settlement, we will find that it is the same mystery. Humans constructed and lived for thousands of years in locations where they should not have been able to exist. Something is drastically wrong with the way traditional archaeology views the past. Heckenberger has stated: 'There was this cherished image that the Amazon was pure nature. The problem is, we have very few good, empirical cases that tell us what Amazonia was like in 1492...' Archaeologists are compelled to revise their views of ancient Brazil. Heckenberger has worked for a decade with the Xinguanos; natives to this area. The first written records come from the Kuikuro; a subgroup of the Xinguanos. According to their oral history, the first Europeans were slavers around 1750. There were once tens of thousands of indians in Xingu. But after enslavement and disease epidemics, their numbers are down to hundreds. What happened prior to the 16th Century in this region was unknown. Researchers, before this new discovery, had believed the Xinguanos were composed of small and 'primitive' tribes who left little imprint on their land. * Are far more technically advanced than expected; their impressive constructions show signs of a mastering of the environment; they orderly built over a huge expanse of land area. * Use complicated math and geometry that was not commonly known to exist for their time. * Express a high awareness of astronomy and even align their structures to the movements of the sun, Moon, planets or solstices. * Have left behind them a people who are the far future descendants of the builders; this LESS advanced race has distant memories of the past; and are virtually in the dark concerning their ancestors. Where TESLA enters the picture has to do with the GRID-concept of ancient architecture. To fully understand this theory, please read the articles 'Wireless World,' 'More on the World Wireless,' 'My Atlantis' and 'Were Costa Rican Spheres Ancient Receivers?' on this website. In 'Wireless World,' a remarkable idea is presented that links the major sites of prehistoric mystery. Too often, researchers are myopic; they study one particular site and do not step back and view everything. The same mystery stands in Egypt with the Great Pyramid; in England with Stonehenge; on Easter Island; in Africa with not only the Tassilians, but also the Zimbabweans and elsewhere. The key to understanding the past is in examining the unexpected similarities in these ancient sites of mystery. It has been said that the 'same construction company went out to specific places and built Atlantean colonies.' The most important factor is this worldwide PATTERN! Where the monoliths; stone circles; mounds; pyramids and other examples of prehistoric wonder are positioned were of special interest. The sophisticated knowledge of the ancients can by understood if you plug in the concept of Tesla Technology. A society based on Tesla's wireless principles would appear as a GRID covering a large area of land. When you examine the 13-point map in the 'World Wireless' article, you will see that one of the grid-points is indeed located in Brazil. This particular map of Earth 'ley-lines' has been in existence since the 1970s. Yet, the Amazon discovery is a recent find and only made it into scientific journals in 2003. In a Tesla System, or a wired system, the main power pole distributes the electrical energy down to smaller (local) stations. The new discovery in the upper Xingu is not the prime, Brazilian receiver...it is one of the local stations. As the 'theory' goes (or according to the 13-point map), the main station is located northeast of Xingu; and more toward the coast. This proposed, primary station would date all the way back to the building of Stonehenge, the Great Pyramid, the first Easter Island statue, etc. Why was Xingu not the main, Brazilian power station? Because of the existence of roads. Wheeled vehicles are relatively primitive. The need-for-roads does not exist in the super ancient sites because our ancestors FLEW! It is much later in time, after many technical falls, did relatively primitive civilizations devolve from a more advanced race. For example, among the Maya can be found small sculptures of delta-wing fighter jets. These early, Central Americans flew planes; but their ancestors were Incas who traveled in saucer ships. The first Incas and first Egyptians were Atlantean survivors; they mastered anti-gravity and moved at the speed of light. Indian migration in the Americas was northward, not southward originating in Asia. Retro-grade technology is the general answer to ancient mysteries. The Cahokia Indians of Ohio are another example of devolved ancients who built on a large grid. These mound-builders were the future descendants of the Maya who could not construct in stone anymore. Their mounds were laid out in a GRID which covers many American states. 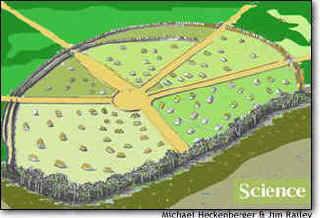 All of their smaller earthen mounds surround the main mound (in Ohio) IN A PATTERN. This main mound is larger than the Great Pyramid. There are relatively small pyramids that surround a primary pyramid; there are small, stone circles that surround the main complex at Stonehenge. In Mexico City, a huge metropolis surrounds the Pyramid of the Sun and Moon. All the stone buildings there encircle the pyramids and are perfectly aligned to the directions. It is this writer's theory that the Egyptian and Easter Island statues as well as Mayan stele (monoliths) functioned as 'utility poles.' Even the mysterious Costa Rican spheres may have originally been placed in a pattern or grid. When researchers find these ancient grids, they should open a Tesla book and study what his 'wireless world' would look like. Grid patterns, or an organization of structures covering a large area, found in the ancient world should not be a surprise. They should be expected. If we examine the picture provided, we see the roads converging to a central point. That center of the upper Xingu could have once contained the (long-removed) power source. EM energy from the main, Brazilian transceiver might have been stepped-down to this point. Then, the energy may have been distributed to surrounding structures. Even indian teepees could have received trace electrical energy that was once, long ago, wirelessly transmitted through pyramids. If one day a Canadian or Australian grid is discovered in the areas specified in the 13-point map, then this writer's theory should be confirmed.